I first became involved in the “Flodden Project”, as I call it, back in about 2010 when a number of meetings were held to discuss how the Battle of Flodden could be commemorated. As an Archivist, I am passionate about taking research back to primary sources (those produced at the time) and reading the originals so that interpretation can be based on personal research and not necessarily what has been written by others. This seemed an important element to take forward in this project because so much has been written about the Battle of Flodden but little is source documented. Therefore, why not get back to basics and find out what was written at the time and interpret it? It is also important to view a battle in context and so, the historical time period was set up to 1603 and the unification of the English and Scottish crowns. The aftermath of the battle was felt in the borders until then. As this was a cross border project, we were very keen to find both English and Scottish sources and involve people from both sides of the border. Therefore, I was paired with Rachel Hosker, Archive Manager at the Scottish Border Archives at Hawick. Before undertaking a large Heritage Lottery funded project, there is the opportunity to undertake a “Development Phase” to establish the viability of a project. Although undertaken in a very tight timespan, this was our chance to establish whether there was enough source material to work with and from that build up a community project involving people in both England and Scotland. We only had three months to do this – April to June 2012 – but it was an exciting challenge for both of us! Although we were able to look at online calendars and catalogues, it was clear that we needed to visit various archives to establish what extant sources were available – why initiate a project based on primary sources without actually looking at them in situ?! This was very important as we had to assess how legible these documents were; in what format (paper, parchment, roll), which language (English or Latin) and whether they could be digitised. Our first visit was to the National Records of Scotland to see what survived in their records. We spent two days in their searchroom, looking at various sources but this proved to be the least productive of our visits as we struggled to find references to Flodden or people involved in the battle. Tantalisingly there was information available up to August 1513 but then a big gap until much later in that year. We were very disappointed, however, on reflection it is what we should have expected. This is often what happens after a battle – the victor will promote their victory whilst the defeated, particularly when their monarch has been killed, will be trying to cope with the aftermath which often does not lead to good record keeping. It also showed us that we probably had to tackle finding Scottish sources in a different way – concentrating on less obvious sources and indirect references instead of State Papers and accounts. day! This visit reinforced that there was material to work with, some of which researchers were either not aware of or had not consulted in relation to other documents and in their historical context. The other memorable visit was to the Duke of Northumberland’s Archives at Alnwick Castle. south of England whilst Surrey had to rely on those in the north. All this research proved that there was a viable community project to be undertaken using primary sources to investigate the Battle of Flodden and its impact in the border area up to 1603. However, now we needed the financial support and people to help us. In December 2012, the Flodden Project heard that its grant application was successful and that we could start our project in January 2013. This didn’t give us much time before the actual commemoration of the 500th anniversary of the battle later that year. It had always been envisaged that the transcription of the documents would be undertaken by volunteers, ideally from both sides of the border. As this was such a specialist task, the volunteers needed training. We already knew some people who wanted to be involved in the project but it was important that as many people as possible were given the opportunity to take part. An article appeared in the local press in January 2013 and it was amazing how many people got in contact wanting to take part. Initially, we had estimated that we might get about 20 people but in the end we had to hold two public meetings in the Berwick Record Office which were attended by over 40 people – way beyond our original expectations! Reading 16th century handwriting is not easy as many of the letter forms are different to those used today and so it is a skill that needs to be learnt. Therefore, over 40 volunteers of a variety of ages embarked on a six week Palaeography course – learning to read old documents. It would have been unfair to plunge straight into an unknown style of handwriting and so we worked our way back from the 19th century, learning techniques, coming to grips with phonetical spelling and deciphering contractions until we reached the 16th century. All the examples we transcribed were from the archives kept in the Berwick Record Office. It was a very intense course but for me, it was a great privilege to teach the volunteers a new skill whilst getting to know them and encouraging them all to get to know each other. Having done the training it was time to practise deciphering and producing a written transcript (another skill) of a couple of documents before starting on the “real thing”. This was crucial because it can be easy to read and understand a document but it requires accuracy and consistency to transcribe the spelling as it appears. By this stage, it became clear that it would be easier to “buddy” everyone with someone else so that no one felt isolated in what they were doing and had someone else to call on when they got stuck. I was always there in the background but unlike other projects the Record Office had undertaken, this one involved home working and using digital copies instead of working in the Record Office on public days under my supervision. This system worked very well and is one I would definitely use again. find out more about places or people mentioned. This led to many of the articles which appear in this publication. The material we transcribed and the information we found also proved to be very useful for the Education element of the project and the work undertaken by Jane Miller. It was wonderful to see how the information found in the documents could be used and interpreted for use by school children – the Alnwick Muster Roll provided authentic names for the time and evidence of armour; the list of horses distributed after the battle again provided more names of those involved and detailed descriptions of horses and the accounts gave concrete evidence of the number of people fighting on the English side and the cost of getting soldiers to and from the battlefield. Although the Flodden Project will officially end in December 2016, it is just the midway point for me and my volunteers. We have all learnt new information about the Battle of Flodden and its aftermath in our area and have a better idea of what a huge operation it was logistically to get both sides to the battlefield in the first place and what it actually cost in monetary terms. 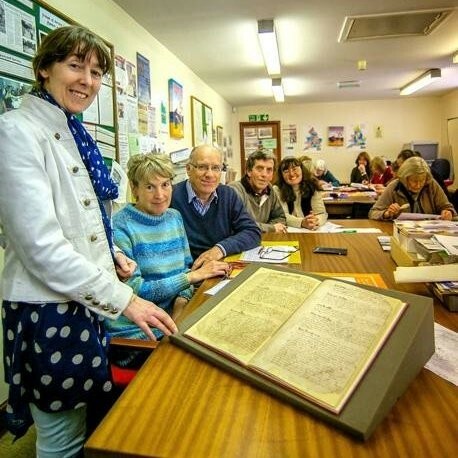 More importantly, we have all learnt new skills which are transferable and can be used in many different contexts – many of the volunteers have gone on to work on other projects using their palaeography skills to interpret other documents. In addition, I now have a band of volunteers that I can call upon to help with other projects and reading old documents. The past four years have flown by and it has been a privilege to work on this project which has opened up new avenues of research and enabled us all to learn about a period of border history which helped shape both nations.